Q* Bert 1983 By: Parker Bros.
Q*bert is an energetic IittIe guy, with a big nose, who hops up and down cubicle pyramids in a magical world. 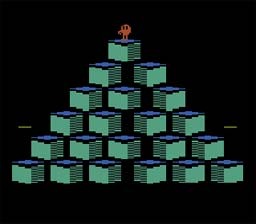 When Q*bert hops on a cube, its top changes color, so Q*bert invented a little game: he loves to go from pyramid to pyramid, changing all the cube tops in each pyramid to another color. But nothing comes easily, even in Q*bert's world. Q*bert's enemies, Sam and Coily, do their best to thwart Q*bert in his colorful game. Sometimes they make Q*bert mad enough to say, "!#?" It takes quick thinking and a quick wrist to help Q*bert change all of the cube tops to the desired color When you succeed, YOU are the Supreme Noser! --From the Atari 2600 Q* Bert instruction manual. Q Bert is a great and highly addictive game. This port to the Atari wasn't very good, like most arcade to Atari ports, but it wasn't as bad as most, either. I found this version to be easier than the NES and SNES versions. This game gets harder as it goes, though. It gets really confusing when you step on a block and it turns back to its original color. Q Bert is a really fun game, so give it a try. Jump on each box to change its color to the target color for that stage. Use the control stick to make Q Bert hop in the desired direction. If you can keep from using your flying discs, you will get more points for them after beating the level.